KindSpring Featured In A Book! 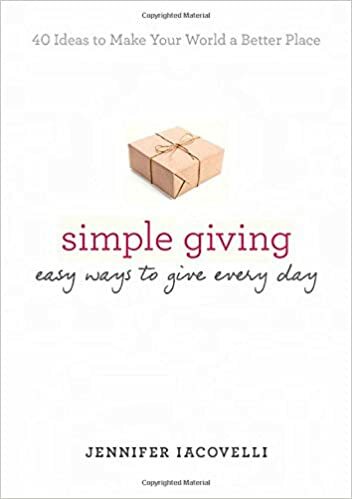 I went to my local library and picked up the book, "Simple Giving", by Jennifer Iacovelli, and from there I read about this site. Since we have two young kids in the house, I got them involved. We read through some of the ideas, printed 10 Smile Cards and went out to do acts of kindness. :) We headed to a local flower shop, and told Ginny at Ousterhout's Flowers that we wanted to randomly hand out a flower, with a Smile Card stapled to it. Ginny liked that idea and also decided to be kind by selling us 12 big, beautiful sunflowers at $25 (my budget) instead of the $3/each!! Yay! The kids and I went for a walk down the boulevard and randomly passed out these beautiful flowers, telling everyone that we hope their day was great! We had fun, and it felt great to give! Thank you for the wonderful idea of Smile Cards! KindSpring, a project of ServiceSpace, is a website dedicated to fostering and celebrating small acts of anonymous kindness around the world. To date, KindSpring has more than 63,000 members in its community, who have more than 72,000 kindness stories and have shipped more than one million Smile Cards all over the world. The concept for KindSpring came about in 2003 when a young college student wondered what it would be like if, instead of hazing, we pranked people with acts of kindness. Instead of humiliating others, what if we put a smile on their faces? Smile Cards were created soon thereafter. Small enough to fit in a pocket, these simple cards had the word Smile printed on them. The cards also included a note that informed the recipient that they were "tagged" by an anonymous act of kindness and were invited to pay it forward by doing something kind for someone else. The website, then called Help Others, was created as a space where people could share their anonymous acts of kindness with a community and find inspiration in the stories of others. People can also order or print out their own Smile Cards, which are available in several different languages. According to Arathi Ravichandran, one of the almost fifty volunteers who run KindSpring's website, the idea is to leverage technology in order to inspire others with small acts of kindness. In that sense, KindSpring provides an easy way for its community to amplify the power of generosity. When people sign up for the site, they are given aliases, keeping members and stories anonymous. No one knows who has performed the acts of kindness reported on KindSpring, making one wonder if someone down the street or across the world might be the perpetrator of a good deed. A newer feature of KindSpring is the 21 -Day Challenge, where participants are encouraged to perform a unique act of kindness each day for twenty-one days in a row. Doing something consistently for three weeks helps to form a habit, while participating with a group fosters bonding and creates shared values. Each challenge focuses on a specific theme ranging from kindness to mindfulness. According to volunteer Audrey Lin, the 21 -Day Challenge was created to support people who wanted to invest in their own microcommunities such as companies, schools, families, churches, and groups of friends. However, anyone can join an existing challenge or host his own challenge. The KindSpring platform is completely ad -free and volunteer run, as are the other projects on ServiceSpace, which runs on three basic operating principles. The organization chooses not to fundraise so that it can serve with whatever resources it currently has and does not worry about asking people for money. Being founded by volunteers, ServiceSpace also aims to remain all volunteer run. Finally, ServiceSpace focuses on taking small steps -- we can't change the world unless we change ourselves and create a ripple effect around us. Other ServiceSpace projects include DailyGood, an uplifting news site; KarmaTube, a collection of inspiring videos; Karma Kitchen, a pay-it-forward up restaurant; Conversations, a collection of in-depth interviews with artists; and Awakin, a curate source of secular wisdom. What a great write-up and ripple from the book! Go KindSpring! This is so beautiful and spot on😍 I'd love to meet and talk with Jennifer! How cool to see this in her first chapter! Thanks Guri! !